Join us for the 2012 Hadoop Summit at the San Jose Convention Center on June 13-14. Ulrich Rueckert, Data Scientist at Datameer and Michael Zeller, Zementis CEO, will be presenting on Wednesday, June 13, 1:30-2:10 pm. While Hadoop provides an excellent platform for data aggregation and general analytics, it also can provide the right platform for advanced predictive analytics against vast amounts of data, preferably with low latency and in real-time. This drives the business need for comprehensive solutions that combine the aspects of big data with an agile integration of data mining models. Facilitating this convergence is the Predictive Model Markup Language (PMML), a vendor-independent standard to represent and exchange data mining models that is supported by all major data mining vendors and open source tools (see figure below). PMML is an XML-based language developed by the Data Mining Group (DMG) which provides a way for applications to define statistical and data mining models and to share models between PMML compliant applications. It provides applications a vendor-independent method of defining models so that proprietary issues and incompatibilities are no longer a barrier to the exchange of models between applications. 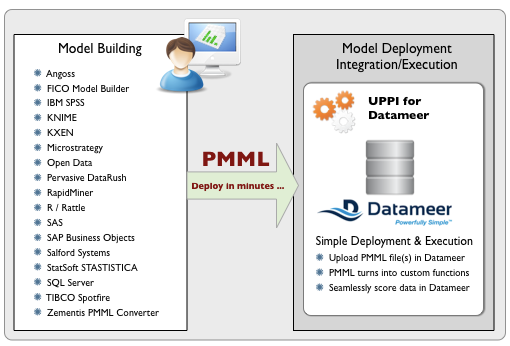 PMML allows users to develop models within one vendor's application, and use another vendors' applications to visualize, analyze, evaluate or otherwise use the models. Previously, this was very difficult, but with PMML, the exchange of models between compliant applications is now straightforward. This joint Datameer/Zementis presentation will outline the benefits of the PMML standard as key element of data science best practices and its application in the context of distributed processing. 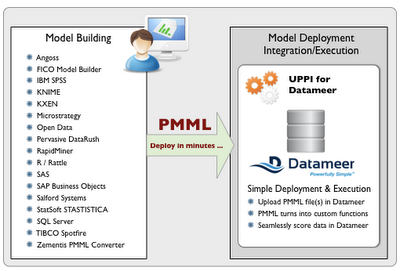 In a live demonstration, we will showcase how Datameer and the Zementis Universal PMML Plug-in take advantage of a highly parallel Hadoop architecture to efficiently derive predictions from very large volumes of data.